A while back I got the headphone bug and purchased a pair of Grado SR80 headphones [new model: SR80i]. I am very pleased with the inexpensive ($99US) headphones which deliver great value. The Grado SR80 headphones have an impedance of 32 ohms, so I built a CMoy Headphone Amplifier in an Altoids mint tin to drive the somewhat demanding headphones. The results were surprisingly good, especially when you consider that one can easily build a CMoy Head Amp for about $20. The CMoy was a huge improvement to a portable media player and rivals the performance of the built-in headphone amplifiers on NAD C162 and NAD 1020 preamplifiers. A while back, I was showing off the Grado SR80 headphone / CMoy combination to a good friend. He is the Walkman, Discman and now iPod type who typically lives with the factory supplied headphones until they die, replacing them with similar light travel headphones. He was stunned with the amazing sound quality, so I let him live with the Grado / CMoy combo for a while. Not surprising, he loved the sound quality, but found that the Grado headphones were too bulky and leaked too much sound for use on public transit. While he found that the combo was not suitable for his daily commute, he was in love with the amazing sound quality and decided to spoil himself. He purchased a pair of Grado SR225 headphones and a Grado RA1 headphone amplifier for use at home. For those of you who are not familiar with the Grado RA1 headphone amplifier, it is well regarded, runs off of two 9V batteries, is housed in a beautiful mahogany enclosure and retails for about $350US. A stock photograph the Grado RA1 is shown below. Recently I had the opportunity to visit and listen to his Grado SR225 / RA1 combination. Of course I brought along my little pocket CMoy headphone amplifier! We both did some blind listening and in the end we pretty much had the same listening impressions. We thought that both the CMoy and RA1 amps sounded excellent and fairly similar, but we both gave a slight edge to the DIY CMoy amplifier. We were both a little surprised, considering you can build a CMoy for about $20 or buy an already built one for about $40 on eBay, yet the Grado RA1 rings in at $350. After a few Google searches, we found that others had reported similar listening impressions between the two amps. That being, they both sound very good, with similarities between the two and the slight edge going to the CMoy. But what I found most interesting were these two sites, one which showed the dissection of a Grado RA1 headphone amplifier and the other which also took apart and upgraded the Grado RA-1. 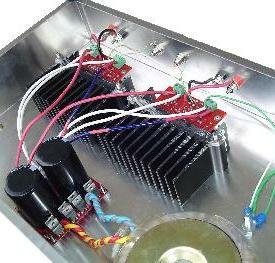 The sites provide pictures of the inner details of the RA1 and also a schematic for the amplifier section. 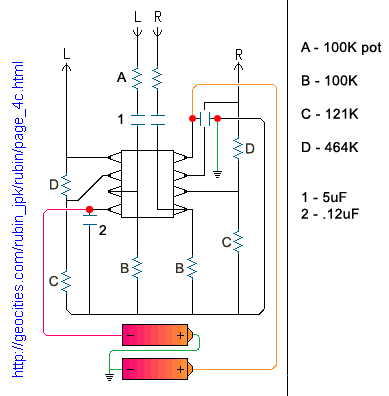 The schematics below show the both the Grado RA-1 and CMoy headphone amplifiers. Both the Grado RA1 and CMoy designs use a basic non-inverting amplifier circuit using an operational amplifier (opamp). For my CMoy, the opamp used was a OPA2132PA (Burr-Brown) which retails for about $5 and for the Grado RA1 uses a JR4556 that retails for about $0.50. Despite the fact that the JR4556 is a low cost opamp, the RA1 sounds decent, but not as good as a properly implemented CMoy headphone amplifier - (DIY lets you choose the gain setting). use a old 8 ohm amp with a adapter or make up a tiny el84se amp that could power it or just buy a lm386 amp. Hi Bruce, no, the opamp cannot drive that load. However, a LM386 (not to be mistaken with a LM3886) could be used to drive 8 ohm headphones. Thanks for the Grado/DIY can's amp shoot-out. The Brr-Brown chips are meant to be the very best so not surprised the DIY amp gave good performance. As you know I stuffed my head phone DIY amp so i'm keen to have another go. Maybe I can come up with a nice cigar box (cedar)to put it in and get the best of both worlds. You know how I love my case-work! Those OPA opamps will NOT drive 8 ohm headphones! You need something like the LM386. Looks nice... but I'm looking for a solution which will drive a 4Vrms output, I doubt this is capable of it. Any ideas or designs you may know of? Thanks. Anthony, what are you trying to drive? Want to take my MP3 player (Sansa e260) and pipe it into my head unit which has a 4Vrms input IIRC. I have it set up, but volume on both devices has to be set rather high to get good signal. I'm guessing a simple headphone amplifier will get the job done well. With the CMoy you can adjust the gain so this should not be a problem. Daniel, from what I can tell in the schematic it looks like the Grado RA1 is the one which has adjustable gain via the 100k pot. And actually now that I think about it, it was the output of my headunit which was 4Vrms, not the input. I think any sort of amplification on the input beyond what my Sansa can drive will be a great help. I'm going to try building one of these powered off of the car 12V with a LM7809 or something. Thanks a bunch! The gain is set using the resistors in the circuit. In the case of the RA1, the gain is 465/122 + 1 = 4.8. In the case of the CMoy I built, it is 8.2 / 1 + 1 = 9.2. 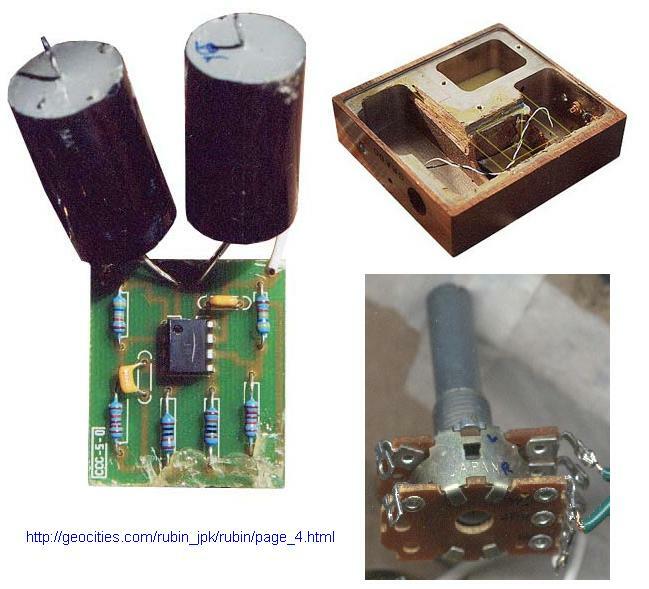 The 100k pot is used to attenuate the input signal. If your source is an IPod, you can skip the pot as the IPod has a built in volume control already. The Grado engineers are smart - the 4556 is a good chip that is designed to drive low impedance loads, like Grados. A higher quality part like the Burr Brown chip is overkill for the audio frequency range and just hurts their profit margin. The cMoy needs an output resistor to increase the load impedance to a suitable range, which results in volume attenuation, but this can be compensated for by increasing the gain of the amplifier by adjusting the feedback resistor. I seriously doubt that there is really much of a sonic difference between these two amplifiers - you would need some very sensitive test equipment to actually compare them. People build these esoteric amplifiers that distort on the order of tenths of a percent, but even the best speakers or headphones distort 5-10%! Take a look at the National Semiconductor LM4562 op-amp. These are very quiet and work great followed by an LH0002 buffer. regarding anonymous comment beginning, "the grado engineers are very smart..." yes they are. 8 or 9 out of 10 people won't hear the difference, even less if you're not A-B'ing it to something else side by side. however, the devil's in the details. i both enjoy and record hi quality audio; the nuances of clarity, imaging, sound staging, definition, frequency response, are very much what defines the hi-fi listening experience from the day to day listening experience. those nuances are what make the (audible) difference between such op amps as the ones mentioned above. to say you need incredibly accurate instruments to measure the difference is correct - the human ear is where it's at, especially a well trained one. the human ear doesn't have a problem dealing with a 120db+ range with 0% signal noise - you'll have a heck of a time finding any gear that can do that. we can also tell the difference between thousands of human and animal voices that we have heard in a matter of a fraction of a second. however, the engineers are smart because they know that there are many people out there that can't tell the difference and really don't care either. that's easily 80% of the market. and yes, that means they make $2 more per unit which works out to much bigger numbers when you're selling thousands or hundreds of thousands of units. the question is not whether it is smart or not in a business sense or a knowledge of electronics sense, the question is a matter of striving for excellence and quality as the main goal. there are few companies around today that prize excellence in their product over profit margin, and the hi-fi lovers among us wish there were more. hi-fi DIYers tend to be both - we're cheap (and/or poor) and we pursue excellence. happy listening. Do you require duplicate circuits for both left and right channels? Yes, only one channel is shown in the schematic. 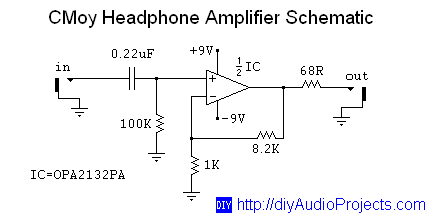 How about this, if you have some low impedance phones, like 8 ohms, to drive, you can get a circuit card from amplified computer speakers and use that. Some even have a headphone jack installed. You can get them at garage sales for a buck. Toss or save the drivers and take out the amp board. You get a small stereo amp that can drive down to 4 ohms perhaps, at around a watt to a watt and a half, and the board will have a vol. control already installed. You get a wall wort for power. Find the part number on the chip and you can easily find the specs online. Upgrade the components if you wish, or experiment on it. For pocket change. I have seen the boards from computer speakers being sold on ebay, as heaphone amps, for cheap! But go to the second hand store or garage sale and for a buck or two you can walk with the basis for a amp that will drive any phones. Just need a new package for the thing, box, tin, etc. I would like to ask about the volume control, where should it be placed? at the power? Who in heaven's name would be using 8 ohm headphones? Aren't headphones normally 32 to 64 ohms? Usually it is loudspeakers that are 8 ohms, or occasionally 4 or even 3 ohms? 32Ω to 64Ω for the typical headphones but there are many other impedances around for High-End stuff.